A new breed of surgeons wielding high-tech tools is taking New York hospitals by storm, winning patients' hearts with smaller scars, less pain, quicker recovery. Of course, they haven't exactly endeared themselves to their old-school colleagues. Camera ready: Dr. Michael Edye and assistants removing a kidney at NYU Medical Center. Jennifer Filippelli, a dark-haired, dark-eyed 30-year-old from the Bronx, felt all along that she would be a strong transplant match for her father, who was in dire need of a kidney: She knew it, you could say, in her gut. "My father and I are a lot alike," she says. "We look alike. We both love animals. And we're both stubborn." That last characteristic proved to be the biggest hurdle in the way of her father's health when testing confirmed that Jennifer was, in fact, almost perfectly compatible as a donor, her blood type and proteins dutifully in sync. Her father wouldn't consider taking her up on her offer. "He didn't like the idea of my being cut open for him," she says. Months passed and still her father procrastinated, even as he continued to retch every morning, ultimately losing some 30 pounds as the effects of kidney failure set in and toxins flooded his body. Finally, Jennifer says, "I threw a tantrum. I explained to him he could be forcing me to live with terrible guilt if he didn't survive." Even that got her only to the next crucial step, which was to have a surgeon explain how the procedure would be performed. For most of transplant history, to donate a kidney meant to accept, in exchange, a permanent ten-inch scar across the abdomen and a six-week stay in the hospital, plus weeks of recuperation. But now, as the beneficiary of the newest minimally invasive technique, Jennifer would be out of the hospital in two days, back at work within three weeks. As for her scar, it would be no more than two and a half inches long -- maybe even invisible by next year's swimsuit season. At last, her father relented. "I don't think we could have convinced him to go forward otherwise," says Jennifer, sitting up in her bed at Columbia Presbyterian Medical Center. Two days after losing a major organ, she looks absurdly healthy, her color high; she'll check out later that day. A crumpled package of Entenmann's cookies beside her bed looks like it's been ravaged. "I would have gone forward with the surgery no matter what," says Jennifer. "But he wouldn't have." "All these New York hospitals were being run by very good open surgeons who missed laparoscopic surgery at the beginning," says Dr. Barry Salky. "And they fought it...who wanted to learn a new skill? It was demeaning." Jennifer Filippelli's story embodies, in many ways, the best of what minimally invasive surgery offers: tiny incisions that open up huge possibilities, transforming our expectations about going under the knife. Surgeons have long been typed as the cowboys of the medical profession, the ones who slash and burn (or cauterize), crack open ribs, lay their hands on the body's vital organs. But increasingly, the city's most respected operating-room practitioners -- among them, Jennifer's surgeon, Dr. Dennis Fowler -- function more like Silicon Valley technicians, operating by remote control, peering at projections on a television screen instead of a gaping incision in the body. Not surprisingly, these new surgeons have been much more popular with patients than they have been with dismissive -- and competitive -- fellow surgeons. They've been embattled within their profession since the techniques were developed a decade ago. "There's a ten-to-one ratio of guys who would love to see us get run over by a truck tomorrow, because they don't know how to do this," says Dr. Richard L. Whelan, chief of colorectal surgery at Columbia Presbyterian. But the remarkable results of minimally invasive surgeries have finally become an irresistible force in the medical marketplace, inciting a fierce bidding war among New York hospitals for high-tech talent, and redefining the future of surgery. Eventually, five, ten, fifteen years down the road, prophesies Dr. George Ferzli, an innovative multi-disciplinary surgeon at suny Downstate on Staten Island, "general surgery as we know it will not be around." Most of the pain in traditional postop recovery comes not from the vital organs that are the objects of surgery but from the slicing of layers of skin and muscle tissue to reach them. To avoid the trauma, the new surgeons operate by inserting a series of tubes into small puncture holes. 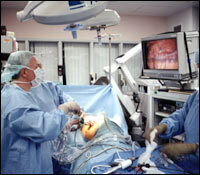 At the tip of one tube is a scope, or camera, that projects an image onto a television screen; another tube, in the case of what is called laparoscopic surgery (which refers to minimally invasive surgery of the abdomen), inflates the body cavity with gas, so the organs float apart and the camera can distinguish between them. Usually, two other tubes serve as channels through which surgeons insert long, spindly instruments with gadgets at their tips that sever, clamp, and staple. It's a difficult new skill set for surgeons to master, and the learning curve is steep. But the advantages are enormous: less suffering for the patient, a shorter hospital stay -- many patients leave within a day or two -- and a quicker return to normal activity. Once considered gadfly specialists ("Nintendo surgeons," their skeptical, older cohorts called them), these doctors are becoming must-have assets for hospital divisions of all kinds: gynecology, neurosurgery, vascular surgery, oncologic surgery -- any department whose doctors manipulate what lies beneath the skin. Even if the new technology is pricey -- sometimes outrageously so -- hospitals with dwindling resources see it as a way to attract the kinds of patients who will make up for their other losses. "If you look back historically, there are advances that moved medicine along, like anesthesia or open-heart surgery," says Dr. Thomas Riles, chairman of surgery at NYU Medical Center. "Those were things that allowed us to treat a whole host of people we couldn't treat before. Minimally invasive surgery is an advance of that kind of magnitude. The bursts of energy and ideas and technology are coming so fast -- we're still just trying to sort it all out." Like most successful revolutions, the minimally invasive phenomenon spread two ways: slowly, then quickly. "When I went to France to learn how to remove gallbladders laparoscopically in 1989," says Dr. Barry Salky, New York's first practitioner of the technique, "my chief of surgery said, 'You can go ahead and learn, but you'll never do it in this hospital.' " In fact, Salky persuaded his boss at Mount Sinai to let him proceed, and his early experience paved the way for his hospital's considerable expansion in the field: Right now, some 28 percent of Mount Sinai's surgeries are performed with the new techniques. What started out with gallbladders has expanded to almost every part of the body: colon, lungs, kidneys, the spine, and so on. But for most of the past decade, New York's entrenched, academic hospital environment lagged behind while the more freewheeling community hospitals -- in Nashville, Atlanta, Kansas City -- forged ahead. "All these New York hospitals were being run by very good open surgeons who missed laparoscopic surgery at the beginning," says Salky. "And they fought it. These people were trained 'big surgery, big incision.' Plus, who wanted to learn a new skill? It was demeaning."